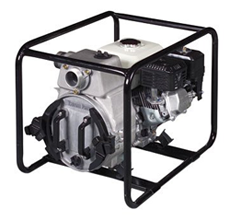 One Source Equipment Rentals has gas powered trash pumps for rent or sale from Koshin, Multiquip, Stow, and Tsurumi. Trash pumps, as their name suggests, get their name from their ability to pump water with high solid content (maximum 25% suspended solids by volume). 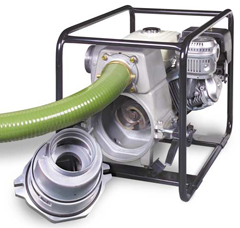 Generally a trash pump will handle spherical solids one half the diameter of the inlet. Cleaning out debris from the pump housing is easily achieved by removing the front cleanout cover. See also submersible trash pumps and diesel powered trash pumps. We have standard duty PVC discharge hose available with male and female NPT threaded couplings, or cam lock quick connect couplings in stock for sale or rent. Custom hoses can be ordered in sizes from 3/4" up 12" and lengths up to 300'. We have standard PVC suction hose available with male and female NPT threaded couplings, or cam lock quick connect couplings in stock for sale or rent. Custom length hoses can be ordered in sizes from 1-1/2" up 12".